Now that we know 300 and Watchmen director Zack Snyder has landed the job directing Warner Bros. new Superman movie, and that the villain in the film will be General Zod, what will Snyder's version of the Man of Steel look like when it reaches theaters in a couple of years? Remember Ripley's powerloader from Aliens? Almost one-quarter of a century after James Cameron showed us what people might use to arm dropships in space, military contractor Raytheon is getting pretty close to making the real deal. In fact, one of the purposes of the XOS 2 is to load ordnance on fighter craft, just like the powerloaders from Aliens. Daniel Kanemoto is a self-professed fan of filmmaker Frank Darabont and comic book writer Robert Kirkman. Like all of us he's been following the development of AMC's Walking Dead TV show and liking what he's been seeing so far. But Kanemoto wanted to take things further and so he went ahead and created his own idea of what the opening credit sequence on The Walking Dead TV show could look like. Alright, maybe not. This fan made faux trailer for a live-action Pokémon movie takes the series in a more gritty and adult direction. Ash is now a grown-up and Team Rocket have automatic guns, Pikachu looks like he's seen better days and the whole Pokémon battle circuit has now morphed into an underground Fight Club. It's Pokémon Apokélypse and you've gotta catch all of this trailer. Does a dead Spock still say live long and prosper? When you think about it Star Trek's Spock is a zombie. Didn't he die and then come back to life in Star Trek III? So what if he didn't have a hankering for Kirk's brains -- he still was dead, shot out of a photon torpedo tube, and then came back to life thanks to the Genesis Wave, a.k.a. Federation zombie resurrection technology. Technically it's still summer but look inside any clothing store and you'll see the fall fashions out in full force. With cold weather a'comin' it's only appropriate to plan ahead and figure out what you'll be wearing when the temperture drops to Hoth levels. Might I suggest a Star Wars-themed clothing choice designed to keep you warm as if you're snuggled up inside a dead Tauntaun's tummy? DragonCon 2010 just wrapped on Monday and I wish that I could have been there. I've been twice to this annual celebration of all things geek, genre and it's great. DragonCon has a vibe that's completely different from Comic-Con in San Diego: less commercial and more fan oriented. Wander the halls outside the rooms where panels are being held and you can bump into anybody. Audiences in movie theaters that have watched the opening to Universal's Devil trailer had an unexpected reaction when the block of text came up with "From the mind of M. Night Shyamalan" on the screen...they laughed at the screen. That's not a good reaction if you're selling a scary movie. And so it begins: the mashup crossbreed trailers for Scott Pilgrim vs. the World. The first of what will be many has the voice track from the Scott Pilgrim movie trailer playing over imagery from The Matrix trilogy -- and for the most part, it works. Frank Miller is back directing again. Maybe if Lady Gaga and Katy Perry wrote songs about golden age science fiction authors I'd like them more. Two days from today, Spike TV and Atom Films will be announcing the winners of their Star Wars Fan Movie Challenge when Celebration V gets underway. My money is on this animated film to win top prize, or at least get its makers a recording contract with Def Jam Records. Did the creators of Final Cut and Photoshop know that they would be ushering in a whole new wave of fan-made content? One of my favorite ideas to emerge from the fan-pro circuit is the idea of a "premake" trailer: what would a much-loved geek movie look like had it been made a generation or two ago? We've seen trailers done for The Empire Strikes Back and Ghostbusters that were pretty slick. Now, from the same mind that brought you those two gems comes the latest premake trailer, one done for the upcoming 2012 movie The Avengers. Oh no they didn't, you're thinking. Oh hell yeah, I'm saying. It was only last week the rumor was heard that Quentin Tarantino was talking to 20th Century Fox about making his version of The Shadow. Now if you're at all familiar with Tarantino's past work then you know he's not the kind of filmmaker to shy away from uncomfortable scenes or heroes that do questionable acts in the pursuit of their version of justice; from the gangsters in Reservoir Dogs to how Bruce Willis and Ving Rhames' characters kiss and make up in Pulp Fiction, Quentin's shown us moments of extreme violence and acts of cruel barbarism. It certainly helps that he's also delivered gripping, good crime drama too and not cruelty solely for shock value. So, entertaining the idea of a guy like Quentin Tarantino getting his hands on a pulp anti-hero like The Shadow, someone who often disposed of criminals by his own hands, what kind of dark hero could we expect Quentin to deliver? Perhaps something like this version of the character. 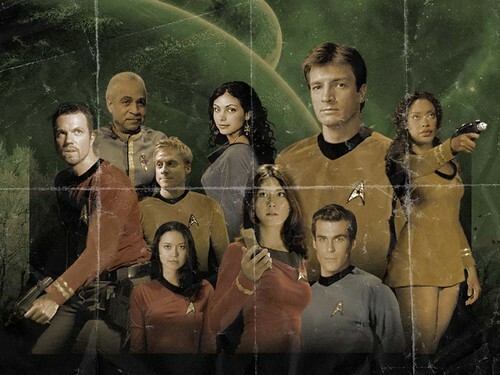 What would the crew of Firefly look like on Star Trek? They'd look a lot like this. Now, can we get one showing what William Shatner looks like as Captain Tightpants?